I had the pleasure of interviewing Sheida Neman, CEO and founder of Boulour Beauty – the first skincare brand that uses CBD to treat acne and aging, while offering a luxury brand aesthetic that appeals to the likes of Sephora. Sheida started Boulour after struggling with her own skin issues and leveraged her background in research to A/B test natural ingredients until she achieved the perfect formula. She’s spent most of her career in market research at Facebook, which helped her identify the skincare industry niche which she calls “Cannabeauty”. I started Boulour because I was looking for an all-natural and organic product to treat my acne-prone skin, but also wanted an elegant formula that felt and smelled good. In my search for homeopathic remedies, I came across research on Cannabidiol (CBD) and how it acts as an anti-inflammatory and sebostatic agent. And, as a San Francisco resident, CBD was everywhere – people were putting it in their coffee, giving it to pets and even using it for menstrual relief. I decided to hop on the crunchy-granola bandwagon and quickly realized the impressive benefits of CBD. While testing formulas early on, I was experimenting with CBD oil to test the efficacy of what they call the “entourage effect”, which is using the whole cannabis plant to magnify therapeutic benefits. Well, one thing led to another and I ended up lathering my lips with a 12:1 CBD to THC tincture that made my lips go numb for a good hour. There are plenty of CBD serums/lotions/balms out there, but they are mostly catered to the hippy/crunch/granola stoner type of consumer. 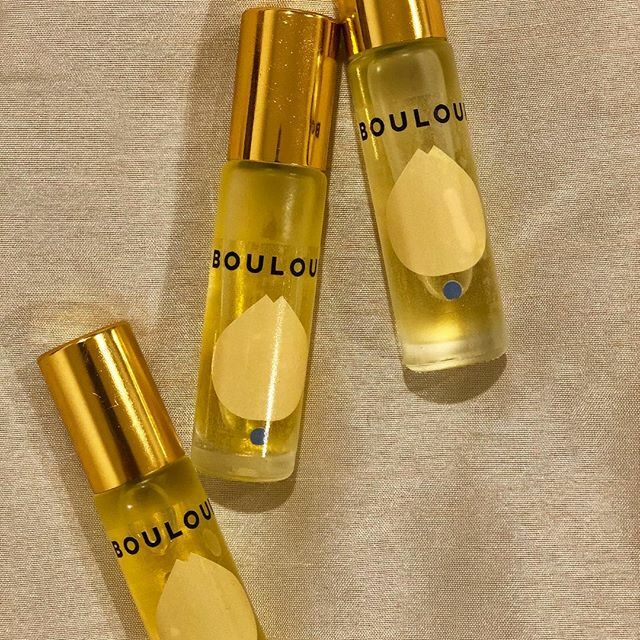 The hardest part of building Boulour was trying to figure out how to elevate CBD as a natural beauty ingredient while neutralizing the stigma of it being a “drug”. My goal was to put this powerful ingredient to work in a modern formula with beautiful packaging, because that’s really what makes it stand out from other CBD products. Once I realized my formula works, I put on my marketing hat and realized that this was a huge untapped opportunity in the beauty space. The best way to build a brand is to BE the target consumer – I’m the quintessential millennial beauty enthusiast so I know exactly what my consumer base wants and how they want to be marketed to. My dear friend Benjamin Levy has been incredibly helpful as both a supportive friend but also a strategic investor who understands marketing, start-ups and what it takes to build something from the ground up. My college roommate Stephanie Ainza was also super helpful in the early stages because she obsessively studies trends in a similar way that I do, but was able to help guide my thinking when I’d either get too narrow or too abstract. Boulour! It’s a never-ending project! I’m a big fan of women supporting women. When I was younger I was surrounded by a lot of catty women, and I want to undo the stereotypes around female friendships. As I’ve gotten older, I’ve realized the power in female friendships and the magic that can take place when women collaborate. In my free time, I mentor younger women who are either still in college or 1-2 years out of college. It’s incredibly rewarding and it’s exciting to see what can happen when you embolden young women to pursue their passions. There are so many! The first that comes to mind is The Female Brain by Louann Brizendine, which I read when I was 16. Having an understanding of the female brain that early on shaped so many of my decisions – from the career I decided to pursue to the way I handled my relationships. Predictably Irrational by Dan Ariely is another behavioral psychology book that fueled my passion for research and consumer psychology. What are your “5 things I wish someone told me before I started my company” and why? Please share a story or an example for each. You’re going to feel lonely, but its ok. Entrepreneurship can be really lonely – you’re spending a lot of time alone working on something that no one knows about, and often times you don’t have anyone to celebrate small victories with or commiserate with. Friends & family are great – but they’re not going to be as passionate and excited when you’ve finally found the perfect shade of bumblebee yellow for your logo…at 3 am. When you’re really excited about something there’s a likelihood that you’re going to want to move fast and build. Not only does this sometimes lead to disorganization and inefficiency, but it’s also unproductive. You need to have a plan on how you want to execute your idea and figure out what that order looks like, even if it’s all very nebulous. You can’t hire a photographer for IG content before the product packaging isn’t final. A lot of people say “let your energy lead your work” – well sometimes you need to stick to the checklist and let it lead your workflow. Plan the work, and then work the plan. My best friend and I decided to start dating a month after I started Boulour. Needless to say, we didn’t follow the standard courting process, and I was able to spend a lot of time on Boulour, which would have otherwise been spent going on dates, curating flirty texts and stalking the person on social media. I’m a big believer in being able to balance both a thriving love life and career, but being an early entrepreneur undoubtedly takes a toll on your personal life, especially when it comes to introducing a new person that wants your love and attention. But being in love AND working on something you love is definitely the most satisfying and energizing experience you can have – so I’d also highly encourage it! I mean, Beyonce is an obvious answer for obvious reasons, but I’d love to sit down with Arianna Huffington to talk about wellness and how she’s thinking about CBD. Female Disruptor: Janine Labaqui is giving men more natural grooming options.